His son had to persuade him to play Aragorn in Lord of the Rings. Viggo Mortensen tells Stephanie Bunbury why he decided to sign on for David Cronenberg's latest film, A History of Violence. A few summers ago, the year the second Lord of the Rings movie came out, a woman was walking along Collins Street talking on a mobile about her evening plans. I vaguely heard something about theatres and cinema times. There was a pause and then, very distinctly, I heard her voice change from normal to plain dirty. "Yes, he's in this one too," she said. There was another pause. "Yes. On a horse." She snickered. Deal done. The girls were off to the flicks. Here was the Viggo Mortensen effect at work. As Aragorn, the perfectly chiselled Mortensen was the embodiment of the fairytale romantic hero, brave yet somehow ethereal, part Chaucer's "parfit, gentil knight" and part rock star. Would so many women of a certain age have gone to see three very long fantasy films full of battles without Viggo on a horse as an incentive? Hey, you do the math. It seems incredible now that Mortensen was, in fact, a last-minute replacement for Stuart Townsend, who dropped out of Lord of the Rings after filming had begun. And that, when that urgent call came, he initially refused the role because it would mean leaving his son, now 18, for months on end while he went to New Zealand. It was young Henry Mortensen, a huge fan of Tolkien's books, who persuaded his dad that this was the role he had to have. And, of course, how right the lad was. Even so, Viggo remains a hard nut for any director to crack. David Cronenberg had to go several rounds of persuasion before he agreed to work on A History of Violence, a rattling yarn about a hitherto gentle and good-natured cafe owner who, when threatened, suddenly finds it in himself to kill a couple of thugs across the counter. Kills them, indeed, with a remarkable show of marksmanship, athleticism and lightning reflexes. Just who is Tom, really? You don't get those kind of skills by operating a milkshake machine. The crucial point, however, is perhaps not Tom's identity. What is striking is that nobody wants to think about the bits of his story that don't fit together. He's the little guy who fought back, a local and then a national hero. At home, those mismatched bits are all over the place. For his wife Edie, played by Maria Bello, it is like a game of Russian dolls: there is surely someone else hidden inside the Tom Stall who loves her, is a father to their children and built their home. In Cronenberg's hands, a story based on a graphic horror novel, A History of Violence by John Wagner and Vince Locke, becomes an impressive fable about the darkness of the human heart. Which is what he promised Mortensen it would be when he flew across the country to take him to dinner and chew a great deal of fat about what the film would mean. What sort of fat? George Bush, says Cronenberg; they discussed American foreign policy. "Viggo is very picky about his films," he says. "One of the elements was to discuss the political undertones of the movie. He wanted to know that I was aware of them, that I found them valuable, that they would be there when they finished the movie and so on." Cronenberg came to the project in 2003. There was already a first version of the script, says Mortensen, which was much closer to the original novel. He didn't fancy it. He certainly didn't want to make an exploitation slasher horror, which is what it seemed to him. Any film, good or bad, takes a huge amount of effort, so you might as well hold out for a good one if you can - and he can, these days, thanks to Middle Earth's bounty. "To me," says Mortensen, "it was a script that 99 per cent of directors would make a bad movie out of. But in this case it was David Cronenberg, so I thought 'hmm', you know." David Cronenberg, Canadian master of the grotesque, has a string of films behind him that explore the nature of being human through science fiction ([i]The Fly, eXistenZ, The Dead Zone[/i]) or tales of madness (Spider), sexuality (Dead Ringers, Crash) or the creative process itself (The Naked Lunch). He had had his failures, but he certainly wasn't a lightweight. Mortensen was ready to be persuaded. "So I thought I'd just ask him: why are you making this movie?" he says. "I wanted to know how he would imagine starting it and what were his intentions, expecting to get a good answer. And I did. I immediately felt we were on the same wavelength of what it could be." Mortensen is not an animated talker; that sigh of a far-off wind you hear in Aragorn's voice is there in everyday life, too. He's on a roll now though, talking about Cronenberg. The thing about David, he says, is that he never takes the easy way out by explaining everything. "He doesn't impose, you know; he doesn't insist you see things any particular way at all. In fact most of his movies start like this one, with you going 'what's happening? Nothing's happening. Is this a BAD movie? Well, it's David Cronenberg, it must be OK.' And after a few minutes you forget these questions, because you're in it. You're there. And, suddenly, you're uncomfortable." Discomfort, it soon becomes clear, is important to Mortensen. He courts physical discomfort through outdoor sports; on Lord of the Rings, he managed to break toes on set but then bruise his face so badly while surfing that Peter Jackson had to shoot around that side of his face. Emotional or intellectual discomfort, meanwhile, sharpens the mind. Cronenberg makes audiences uncomfortable, he goes on, partly by provoking questions without offering any answers. "I think it's like instead of opening a door and pushing you inside a room, he opens the door and then he walks in and you have a look and say 'what's he DOING in there?' He encourages the audience to think for itself, which is great. And I think that these days, whether it's movie-makers or writers or certainly politicians, there is not much encouragement for people to think for themselves. In fact they would prefer that you didn't, because then they can sell you whatever they want. He doesn't do that." Hence the intense discussions of George Bush and the state of the nation. Inevitably, the film has become part of the urgent, seemingly insoluble discussion of gun laws in America, another fictional echo of Bowling for Columbine given particular resonance by the fact that it is made by a Canadian. Both Cronenberg and Mortensen, however, see it as more broadly political. For Mortensen, in A History of Violence, the crucial moment of confrontation at the heart of the film can be writ much larger. The same questions about authority and responsibility posed by Tom's moment of extreme self-defence apply as much to America's foreign policy. Those questions could, however, strike a chord anywhere. A History of Violence could, he says, just as easily be set in a small town in Sweden and directed by Ingmar Bergman. "Why is a person who killed somebody in his diner applauded by the town?" asks Mortensen. "This is not a particularly American thing; it is a human behaviour thing. These people's first response is to say 'yes, good, he killed those bad people'. It's kind of giving up authority over yourself, in a way; if you think of it in terms of a whole society, it's like saying 'oh, you make quick decisions, good, I'll let you think for me', if you want to extend it. "This is how certain people become leaders of countries or movements. Why did I ever vote for this person? Why does a country go to war? Why does a country become a fascist dictatorship? It's not because the people of Germany or the United States or Spain are better or worse than anyone else. These things just happen. People do this. People see someone act forcefully and they go 'yeah!' It's easier than thinking for yourself." We all, he says, share a will to submit. "It's not about America," says Mortensen. "It's not even about violence. It's a love story that deals with this problem of authority." When the film screened in Cannes last year, the general buzz was that it represented Cronenberg's jump into the mainstream: A History of Violence had a conventional narrative complete with surprise twists, empathetic characters and no weird growths, dismembered innards or imaginary insects to confuse the punters. That wasn't how Cronenberg saw it; he says his most mainstream project was probably The Dead Zone, based on a Stephen King novel and such a conventional story of small-town life it even featured a sheriff. "So I don't really think about 'now I'm going mainstream' or 'now I'm going independent' - it really is project by project that I take it," he says. "I know critics like to lock in trends and tendencies, but from the inside that is irrelevant, none of that really matters." It was also true that Cronenberg's take on Wonderful Life territory always seems unconventionally off-kilter. Everything is too highly coloured, as if lifted from a postcard. Howard Shore's music is unsettlingly familiar, like a dreamed version of a film - probably a '50s western - we have seen before. And there are still vestiges of the slasher original in Ed Harris's villain and Tom's bizarre brother, played by William Hurt. It's Cronenberg's twist on mainstream, in fact, which leaves a lot of sting in the tail. "I was very interested in a story about a so-called normal family, in fact almost ideal," says Cronenberg, "and then see what happens when you start sliding it towards abnormality. Because what is revealed there is not just the obvious discussion of violence, but also sexuality, marriage, family and identity." Mortensen talks about Cronenberg with a particular intensity; it is clear that making A History of Violence was an intellectual engagement as much as anything else. But if he had his druthers, Mortensen said after Aragorn made his face famous, he would never make another film. Fame doesn't suit him. "After working 22 years without thinking about it," he says wearily, "all of a sudden it's different. You walk down the street and people want to take a picture, something for their nephew or their sister; I never had to deal with it before and now I do. I find it strange. I'm flattered on the one hand, but on the other hand you know, I would like to be able to go into a pub and have a drink." He tends to stay at home now, he says, simply to avoid having to explain himself to strangers. "People always say the same thing very politely: 'I'm sorry to disturb you, I know you're sitting here with your intimate friend having dinner BUT I'm going to disturb you anyway.' And you do that for about half an hour and then you go home. Sometimes I get annoyed, but the best thing to do is leave." Not that he doesn't try to be positive. Fans cluster around, as he says, because at some level they connect with the work. "If you stop and think about it, it's a good thing. But I'm not 21 years old, so in a few years it will probably end." In the meantime, too, it has its upside. Acting is only one of many strings to Mortensen's bow. Long before anyone had heard of him, back when he was working tables and on the docks and selling flowers on the New York streets, he published a book of poetry called Ten Last Night. He still writes, as well as exhibiting photographs and paintings and playing in a jazz band. The band has released three CDs and he is established as a painter; in fact he did all his character's paintings in A Perfect Murder himself. People even want to read Aragorn's poetry. This is a considerable boost to his small publishing firm, Perceval, where sales of his books help finance the publication of unknown young writers. Fame has nothing to do with any of it, but it helps. 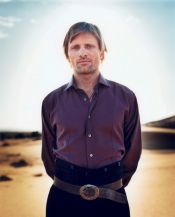 Viggo Mortensen turns 48 this year. It has been quite a journey from the small role in which he first made his mark, playing a young Amish farmer for Peter Weir in Witness (1984). Since then, his choices have garnered him plenty of respect for frequently taking the road less travelled. He had roles in films as diverse as Sean Penn's The Indian Runner, Brian de Palma's Carlito's Way and Jane Campion's Portrait of a Lady. His most recent film, Alatriste, made in Spain by Agustin Diaz Yanes, dealt with the country's Golden Age of colonialism; Mortensen speaks Spanish as well as he does English and Danish, having lived in Argentina until he was 12. The Viggo Mortensen effect is clearly cross-cultural. We return to the question of violence. A History of Violence may suggest darkness seethes beneath every human surface, but Mortensen takes a kinder view. "Violence is somewhat inevitable, perhaps not in every person but where there are humans, where there are most animals, it exists somehow. As humans, we have free will. You can think for yourself; you can question authority; you can question received notions and learned behaviour in yourself. You can. You can say no to violence in many cases and, to me, that is what is going on in this story. And that, to me, is interesting." Perhaps he really didn't need all that much persuasion after all. © The Age Company Ltd.